Anyone still obsessed with the song "Cheap Thrills" by Sia ft. Sean Paul? No, just me? I am still obsessed with song even though it came out over a year ago. 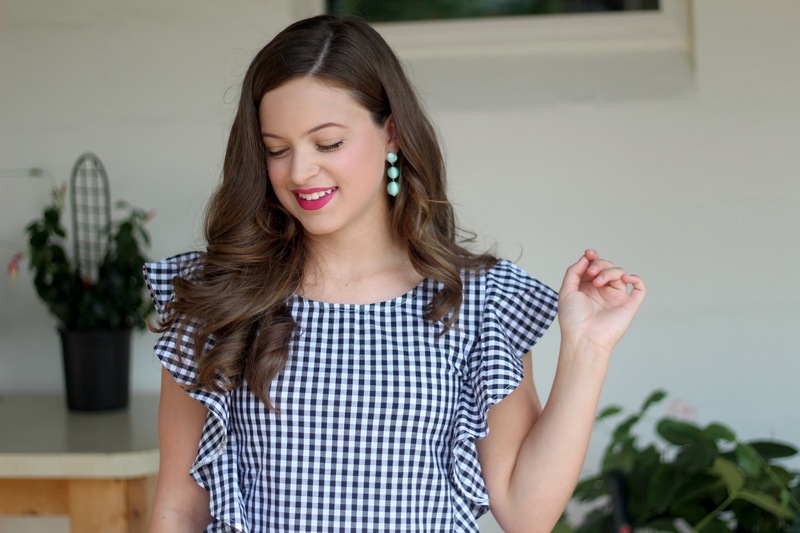 This song always puts me in such a good mood, just like this gingham top! 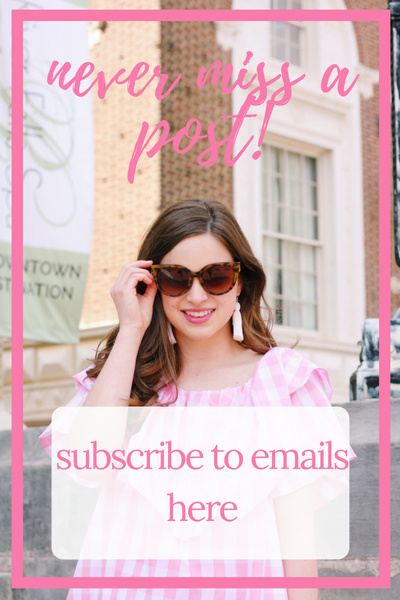 See how I segued into this post?? 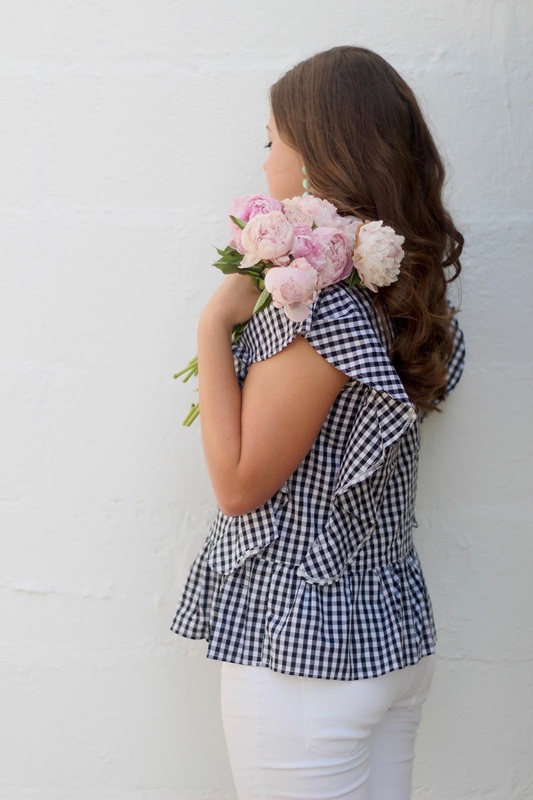 I call this top my "gingham thrills" top because it has everything I was looking in a gingham top- ruffles and the perfect shape. 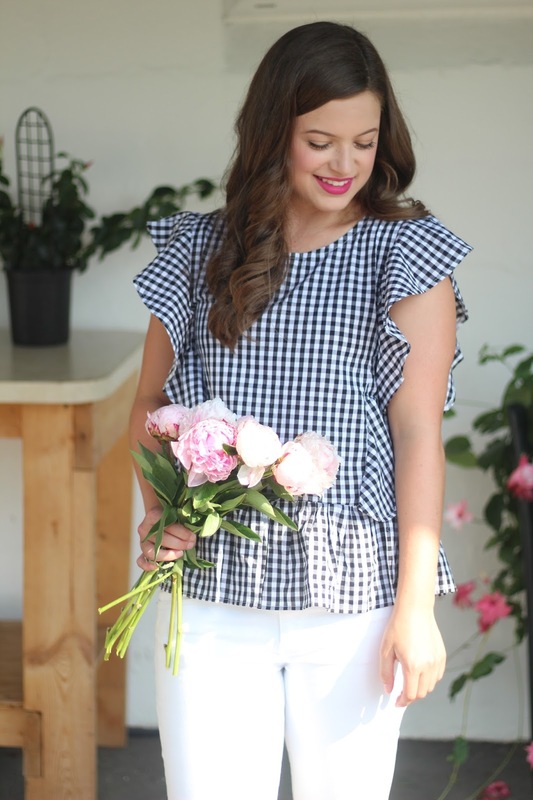 I love how this top is such a statement on its own, but I made sure to add some other lovely pieces (including these peonies) to the look to make it even more of a thrill. Enjoy! 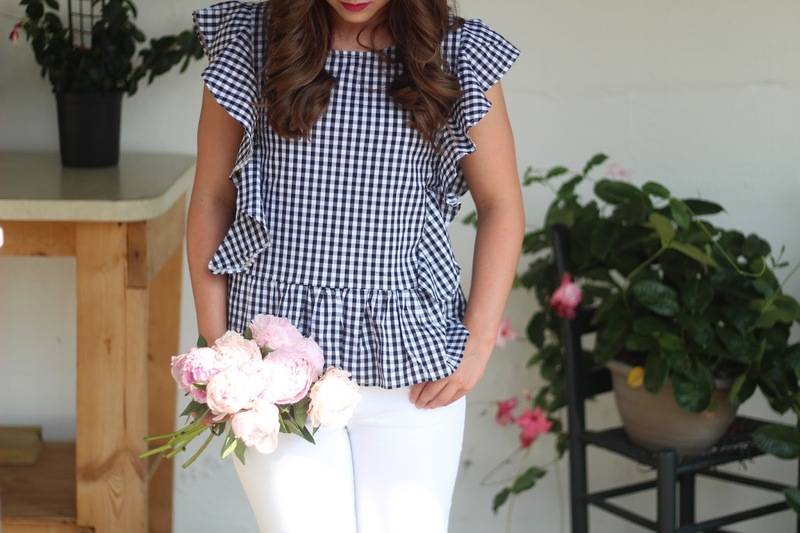 I purchased this top off of Shein after asking you all on one of my Instagram posts about where you have found your favorite gingham blouse. 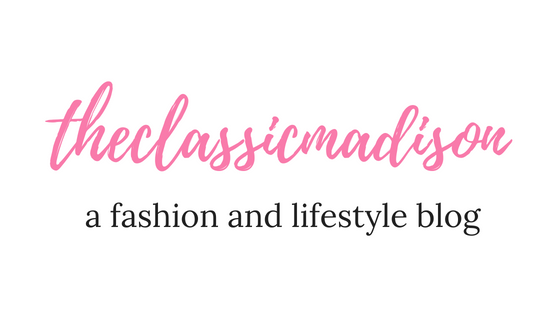 A lot of you suggested Shein, which is a website a purchase from quite frequently (as I'm sure you know!) 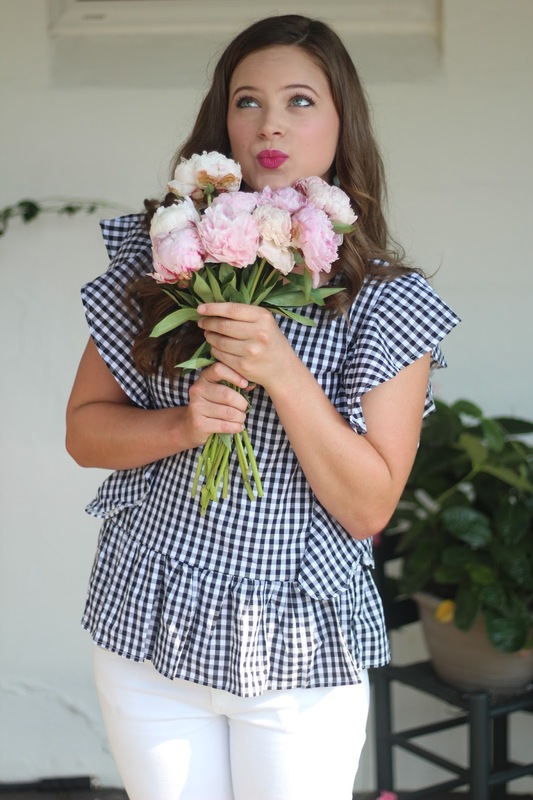 When I did some Shein scouring, I found this adorable gingham top. I sized up because Shein sizing can run slightly small, so this is the top in a medium. I love the way the ruffles cascade off the shoulders. The peplum ruffle at the bottom adds even more flair to the piece. 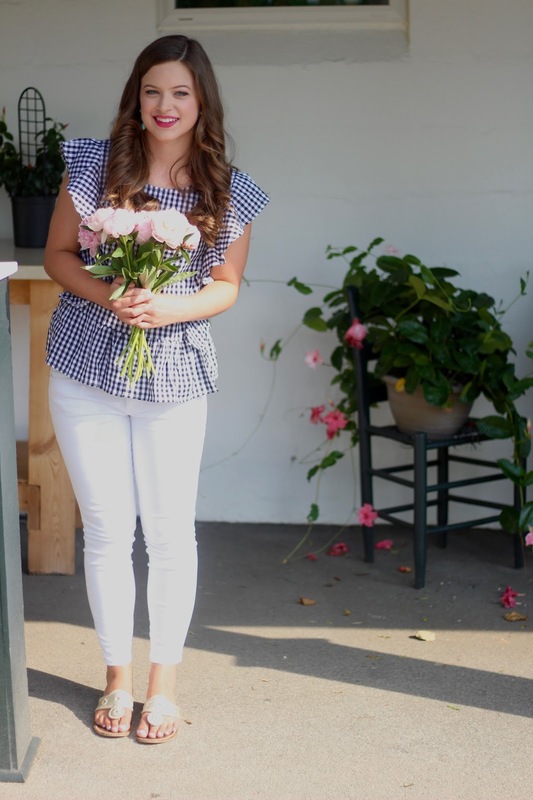 I love the way gingham looks with white jeans and a pair of Jacks, so nothing new here with the combination! I have the hardest time finding white jeans that aren't see-through and these are just the right opaqueness. Now let's talk about these bubble earrings. I love the Bauble Bar drop ball earrings, but not the price. I found this teal-colored pair on Etsy a couple weeks ago and I am in love! 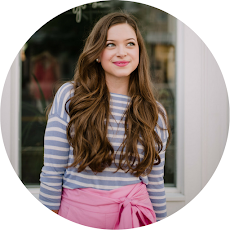 The color looks great with gingham! And for the final accessory- peonies. I know peonies are a bit over photographed on Instagram, but they seriously are my favorite flower. They're hard to find where I live (maybe I'm just not looking at the right places!) but I finally found some the other day and had to take some pictures with them. I've always told people I want pink peonies at my wedding, they are so pure and classic! Thank you all for reading. I hope you enjoyed my version of "Cheap Thrills" in an outfit. 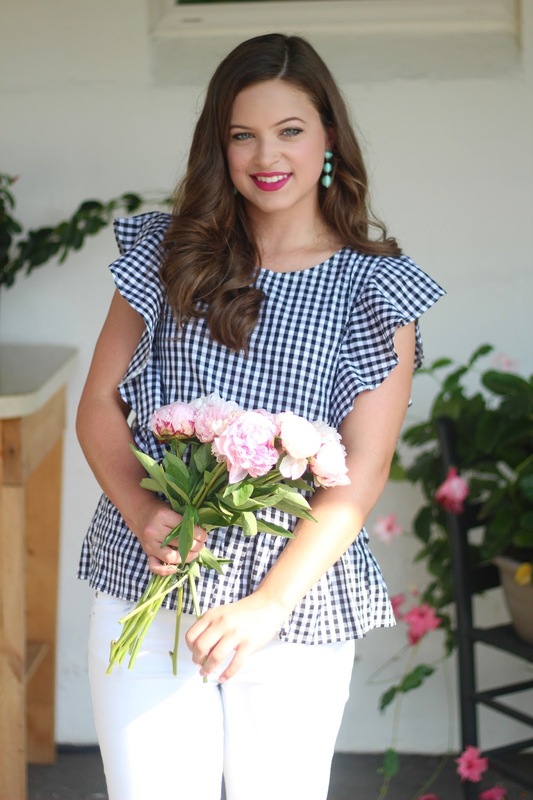 Peonies, gingham, and statement earrings? Yes please! See you all next week!